In the wild outreaches of the Dounreay Contamination Zone, the evil Laird Murdo McClearance leads the hunt of Wild Scotties, getting in so close he can "hear his quarry grunt". Could this be the future of Scottish tourism? Innocent Scots like Shooey McBam, Airchie & Lurchie McRaddie, and Wee Hamish McFeefifofum, gunned down with electro-cannons for sport? Possibly, if this week's 2000AD comic and its Judge Dredd story 'Bodies Of Evidence' are to be believed. 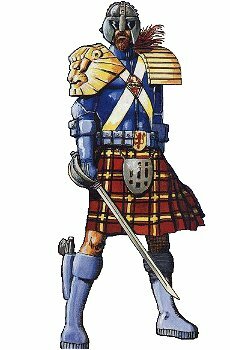 Orkney artist Cam Kennedy and Dundee-trained writer John Wagner tell a futuristic tale of Cal-Hab (23rd Century Scotland) and how Doogie McBam must travel to Mega City one to get Judge Dredd (the Desperate Dan of the future, see picture below) to save the day. High-resolution artwork from the story is available on request, or you have permission (press or media) to scan from the comic itself. The story 'Bodies Of Evidence' is in today's 2000AD and continues for the next 2 weeks. Available for interview, editor Andy Diggle on (020) 7357-0130 or email Andy@2000ADonline.com + access to the writer and artist John Wagner and Cam Kennedy (subject to clearance). 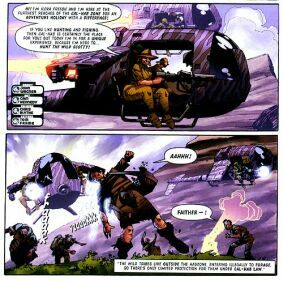 2000AD Comic starring Scotland's Finest - oot the day! 2000AD comic is published every Wednesday by Rebellion, priced just £1.40 (Earth money).